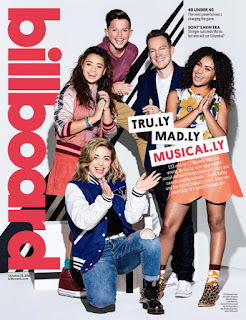 musical.ly, the world's fastest growing video social network is on the cover of this week's Billboard Magazine. Billboard describes the platform as a "bona fide cultural phenomenon" and "trend-setting app" that is "changing the music industry" for its "ability to translate song clips into streams and sales." Further highlighting the platform's cultural impact, musical.ly has launched a new program called #NextWave to support music discovery on the app. Starting this month, musical.ly will feature a special #NextWave folder each month that will contain 15 songs from new and emerging artists. The artist that has the most videos created to their song in the #NextWave folder, will earn a campaign on musical.ly's coveted homepage, providing exposure to over 133 million users. British sensation Anne-Marie, who the Independent calls "one of pop's brightest new stars," is the winner of #NextWaveOctober. Anne-Marie's catchy new R&B/pop single "Alarm" peaked at #1 on the musical.ly Top Songs chart. "At musical.ly we are always thinking of new and innovative ways to enhance the app experience that speaks to our passionate 'musers.' With the launch of #NextWave, we're excited to support so many of the emerging artists that contribute to our creative community and help them reach a broader audience," Inga Bereza, Director of Music & Entertainment Partnerships at musical.ly, said. In total, over 488,000 musical.ly videos were created for the #NextWaveOctober campaign, resulting in more than 76 million total views. In addition, 5 of the #NextWaveOctober songs charted on musical.ly's top 100 songs chart. More information on the #NextWave program can be found HERE. musical.ly has attracted major artists and entertainers including Gwen Stefani, Alicia Keys, Britney Spears, Selena Gomez, Ariana Grande, The Chainsmokers, Meghan Trainor and Jason Derulo to name a few. It has become the ultimate destination for users to share, discover and create videos with their peers. Most recently, musical.ly was described in VICE Magazine as 'the music industry's new secret weapon" and also featured on the Billboard's Digital Power Player's list for its groundbreaking success and unique position in the digital and music spaces. The platform has also been featured in numerous segments on Good Morning America. Founded in 2014, by creator Alex Zhu and longtime friend, Luyu Yang, musical.ly is a video social network for creating, sharing and discovering short videos. Every day, millions of people use musical.ly as an outlet to express themselves through singing, dancing, comedy, and lip-syncing. The app celebrates creativity with videos that are shared across the musical.ly community. With over 133 million users, musical.ly has hit #1 in the iOS app store for free apps in 20 countries - including the United States. In June of 2016, musical.ly released its breakout livestreaming platform live.ly, which provides the musical.ly community with a broader canvas on which they can express themselves. Immediately following its official launch, live.ly began trending and hit the number one spot in 8 countries in the iOS app store. musical.ly is available for download through the Apple App Store, Google play, or the Amazon Appstore.